Sunny is golden brown or reddish brown all over with some white running down his chest. 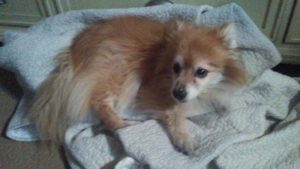 He is a bit larger than a normal Pomeranian, so he must be mixed with something. He is the sweetest. He loves attention and to be by your side all day.